There has been a major shift in the way that digital media is bought and sold, which has opened up a lot of new digital targeting opportunities for marketers. While programmatic is not new technology, a lot of people are not aware of what it is and how they can use it. A Pulse Study found that ⅓ of Fortune 500 brands are not using any programmatic techniques. Of those that are using programmatic, ¼ of feel they need more education on how to use programmatic techniques. What is Programmatic Media Buying and how it is different? Programmatic helps us buy media faster and more efficiently by taking humans out of the equation at certain points. It also opens the doors to more robust targeting. DoubleClick Bid Manager, Turn and MediaMath are some of the automated systems that have made programmatic media buying easier. Real-Time Bidding is the buying and selling of ad inventory in real-time auctions. This means the ad is actually purchased at the moment the user is seeing it. RTB is an ad space for marketers and doesn’t require human media buyers. How does RTB and Programmatic add value to our world? Programmatic is here and it’s here to stay. It not only has become a staple of modern media buying but is slated to account for 50% of digital ad sales. It is the future of media buying for digital, but also TV, display, video, broadcast radio and publications. RTB and programmatic allows us to deliver the right ad to the right people at the right time. This new technology enables optimizations because we can see rich data of ad performance and can know which targeting methods are working. 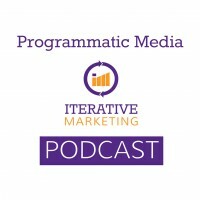 How does programmatic fit into Iterative Marketing? Programmatic gives us the means to get the right message, to the right person, at the right time — which is a key component of Iterative Marketing. The first thing is to find a DSP partner — SiteScout, ExactDrive or BlueAgile — that will allow you to get your toes wet – preferably one that allows you to start small. For other references, check out: Real-Time Bidding, Private RTB and Programmatic Direct and why marketers should adopt programmatic marketing.